Massey Decks and Fences custom designs and builds wood and maintenance free composite decks of any style or shape that fits in your budget. Our homeowners and commercial customers add decks to give their property extra value, superior appearance and functionality needed of any home, apartment or condominium. 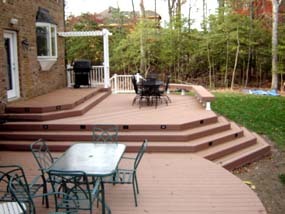 Some of our composite and wooden deck customers are in these communities: Leonardtown, Lexington Park, Charlotte Hall, California, Mechanicsville, Wildewood, Hughesville, Great Mills, Hollywood, Barstow, Broomes Island, Chesapeake Beach, Dowell, Dunkirk, Huntingtown, Lusby MD, North Beach, Owings, Port Republic MD, Prince Frederick, St. Leonard, Solomons, Sunderland, Waldorf, La Plata, White Plains, Hughesville, Indian Head, and Bryans Road. Southern Marylanders build decks to be used all year just like patios. Decks enlarge your outdoor living space, increase the value of your house and give you more area to entertain your friends and family. Massey Decks and Fences can custom build wooden or composite decks of any design, style, or shape, to fit into your budget. 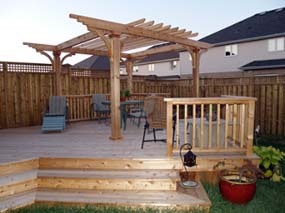 We build custom decks for residential and commercial customers to add that extra value their property has been missing.